Welcome the Future of Friendship project! Welcome the Future of Friendship project! This project was conceived of and is facilitated by Canadian educator Bill Belsey. Dunbar’s number, named for anthropologist Robin Dunbar, proposes that the number of meaningful relationships a human being can maintain is capped at around 150. During the early days of Facebook’s rise, commentators tried to apply Dunbar’s number to our ever-loosening online definition of “friend.” Now Dunbar himself has undertaken a study of Facebook and discovered the average person only has four “real” friends on Facebook, and around 14 people who give a crap at all. Depressing! In an effort to determine whether social media can break past the apparent limit on our real-life friend networks, Dunbarsurveyed more than 3,000 Facebook users, with an average “friend” count that shouldn’t be surprising: 150. But of those 150 friends, people said they could only count on 4.1 in an “emotional crisis,” and that only 13.6 were close friends who could be counted on for sympathy. He also found that social media alone isn’t enough to maintain our close friendships. Talking online can slow down the decay of a relationship, but if we don’t see our best friends face-to-face, they’ll eventually fade from our group of four, to the group of about 14, to part of our 150, and eventually out into the ether of our 500 loose social contacts. Technology can do a lot of things, but it still can’t give us more friends. Study: How many Facebook friends are real friends? 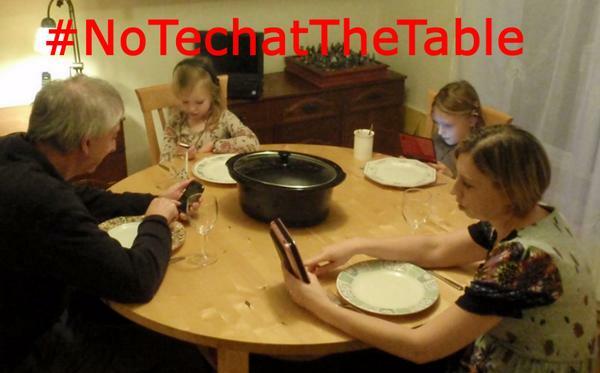 Parents: Please consider having a #NOTechAtTheTable rule. Make time each day to talk & especially LISTEN to your kids!